Working in slippery conditions can pose a high risk to your well being, which is why the Nitrilon Duo-Lite Nitrile-Coated Grip Gloves utilise a nitrile coating to offer exceptional grip. Ideal for wet and slippery working conditions, a comfortable, anatomical and flexible fit ensures the user is safe when handling goods. 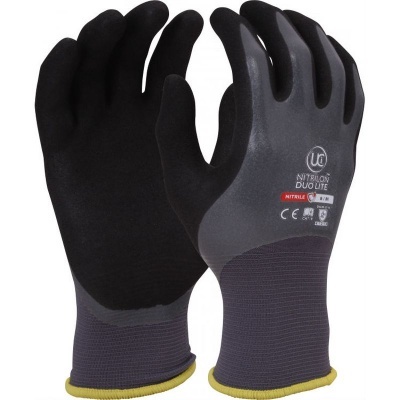 The Nitrile-Coated Gloves are available in four sizes that should suit the hands of most users. Please measure the circumference of your hand around the knuckles (excluding the thumb) with your hand open and your fingers together, and the length of your hand from the tip of your middle finger to your wrist.